Dagenais, Maxime. "John Neilson". The Canadian Encyclopedia, 27 April 2018, Historica Canada. https://www.thecanadianencyclopedia.ca/en/article/john-neilson. Accessed 24 April 2019. John Neilson, newspaperman, publisher, editor, politician (born 17 July 1776 in Balmaghie, Kirkcudbrightshire, Scotland; died 1 February 1848 in Québec City, Canada East). A staunch moderate, John Neilson supported a greater balance of power in the colony. Sympathetic to French-Canadians, he was a deputy with the Parti canadien in the Legislative Assembly – which later became the Parti patriote – and broke away when the party radicalized in the 1830s. Though he opposed the party’s republican and nationalist policies, Neilson continued to fight for French-Canadians, heavily condemning the Union of the Canadas in 1841. Born in Scotland on 17 July 1776, John Neilson arrived in Quebec City in 1791 where he started working in his uncle’s print shop then run by his older brother Samuel. He took over in 1793 following Samuel’s death, first under a guardian and then independently when he came of age, in 1796. The shop published much material, leading James Brown – Neilson’s main rival – to claim that it was “the largest consumer of paper in this country.” The shop printed government proclamations, statutes, and the journals of the Legislative Assembly. It also printed The Quebec Gazette/La Gazette de Quebec, a newspaper co-founded in 1764 by Neilson’s uncle, William Brown. The newspaper’s editorial duties also became his following Samuel’s death (see also First Newspapers in Canada). 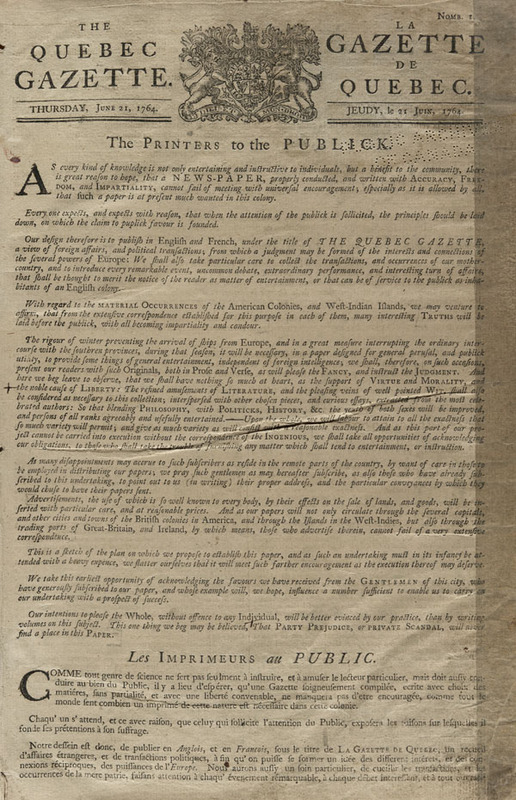 The first edition of the Quebec Gazette, published Thursday 21 June 1764, in Québec City. Neilson published a variety of other material, including music texts. For instance, in 1800, he published Le Graduel romain, a collection of chants and texts for mass, the first music published in Canada. In 1801, he also printed Le processional romain, in 1802 the Vesperal romain, and finally in 1819, the Extrait du processional romain. John Neilson also printed Joseph Quesnel's Colas et Colinetteou Le bailli dupé(1808, but not distributed until 1812)– one of the first operas written on Canadian soil – but Neilson’s efforts to negotiate the publishing of the music were abandoned after Quesnel’s death in 1809. In 1818, Neilson became a deputy in the Legislative Assembly. During his tenure at the assembly, starting in 1822, he gave the print shop to his son, Samuel. 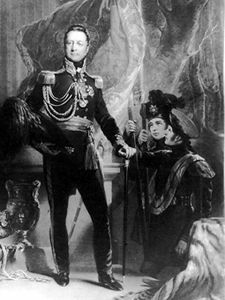 Following Samuel's death in 1837, Neilson’s other son, William, took over. Of note, William published the Algonkian-language hymnbook Aiamieu kushkushkutu mishinaigan (1847), edited by Father Flavien Durocher. The book was arguably the first in Canada to include music with the native texts (see Indigenous Languages in Canada). Politically, Neilson was a “moderate reformer” and found a home with the Parti canadien. While he supported a greater balance of power, greater accountability towards the Legislative Assembly, and opposed the absolute authority of the governor and his councils, he strongly believed in British institutions and favoured a strong connection with Britain. Neilson was also a friend of French-Canadians and supported the preservation of French-Canadian culture, unlike many of his English-speaking peers that sought assimilation. 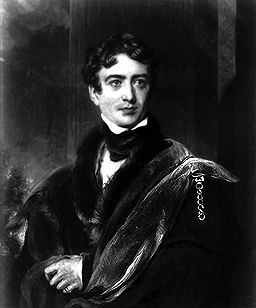 During the Rebellions of 1837 Papineau lost control of events that he was instrumental in creating (courtesy Library and Archives Canada/C-11075). 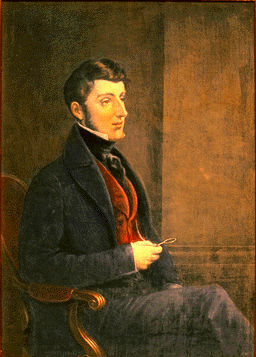 During his tenure Dalhousie founded Dalhousie College and the Québec Literary and Historical Society (courtesy Metropolitan Toronto Reference Library/T31639). Neilson played an important role in the assembly. In 1823, for instance, he accompanied Louis-Joseph Papineau to London to present the House of Commons with petitions opposing the Union Bill of 1822. In 1828, he again travelled to London to protest Governor Dalhousie’s behaviour in Lower Canada. Unhappy with the Parti canadien’s (now the Parti patriote)control of the assembly, Dalhousie had prorogued government in 1827. Neilson presented a petition, signed by over 87,000 people, to the House of Commons. In the early 1830s, a split began to appear between Neilson and the party. Frustrated by the governor and Britain’s unwillingness to reform the colony, the party began to radicalize, demanding a total reform of the colonial government, including an elected Legislative Council and greater authority to the elected assembly. Neilson criticized Papineau for favoring the party’s more nationalist and republican elements. 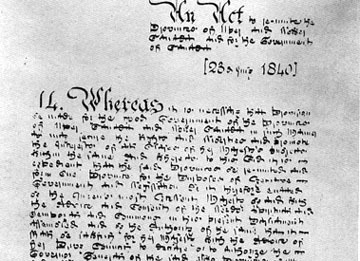 This split turned into a divorce in 1834 when the party adopted the 92 Resolutions. Neilson was a moderate, working within the confines of British conventions to better the colony. The 92 Resolutions were a rejection of these conventions, showing the party’s “growing commitment to the ideals of democracy” and republicanism. Initially opposed to the governor’s abuse of authority, Neilson now turned against the party that he had been a member of for 15 years. His opposition to the 92 Resolutions cost him his seat in the 1834 elections. He returned to the helm of The Quebec Gazette. Despite an unpleasant break with the party, Neilson remained a devoted moderate and continued to empathize with French-Canadians. This was especially evident during the period of the Special Council (1838-1841), a period during which the Legislative Assembly was dissolved, the constitution suspended, and control over the colony given to an appointed council headed, over that period, by three different governors. The Arrival of Lord Sydenham, Governor General. 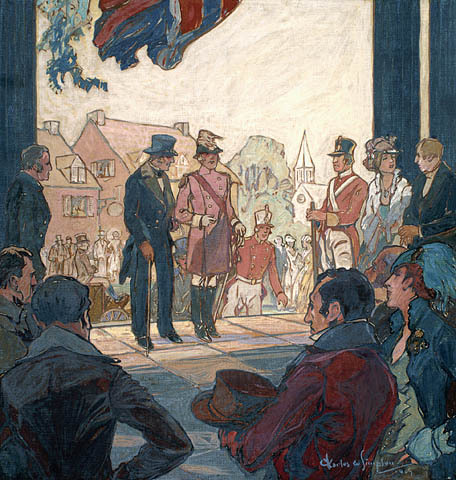 Opening of the Union Parliament, Kingston, 1841, Artist: Charles Walter Simpson, 1927. 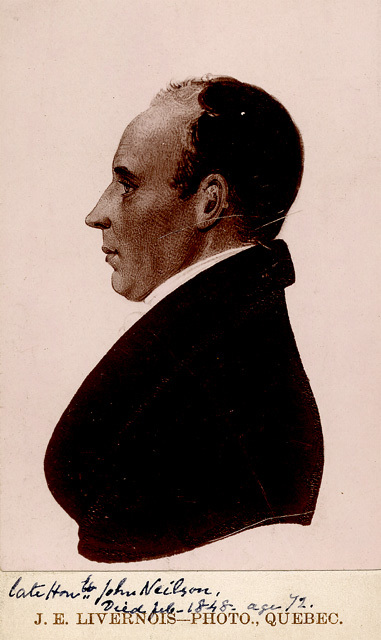 Sydenham persuaded the legislature of Upper Canada to consent to a union with Lower Canada and framed the Constitution of the united province. In April 1838, Neilson was appointed to the Special Council. Though he initially supported the council, arguing that it could restore peace and stability to the colony, he eventually turned against it, stepping down in 1840. Neilson was especially critical of the fact that the Special Council, two years after the rebellion, still had absolute authority. Control over the colony should have been returned to the people. As such, he condemned the council’s ordinances, arguing that they did not represent the will of the people, but only that of the councillors. Neilson’s popularity grew as a result of his fight against union and, in the first election following the Union of the Canadas in 1841 (see Province of Canada), he was elected to the Legislative Assembly. There, he continued to fight union – even asking for its repeal – and led a group of French-Canadians against it. Three years later, he was named to the Legislative Council, where he remained until he died on 1 February 1848. Beyond politics, printing and publishing, Neilson was affiliated with numerous cultural, educational, agricultural, and mutual aid organizations. 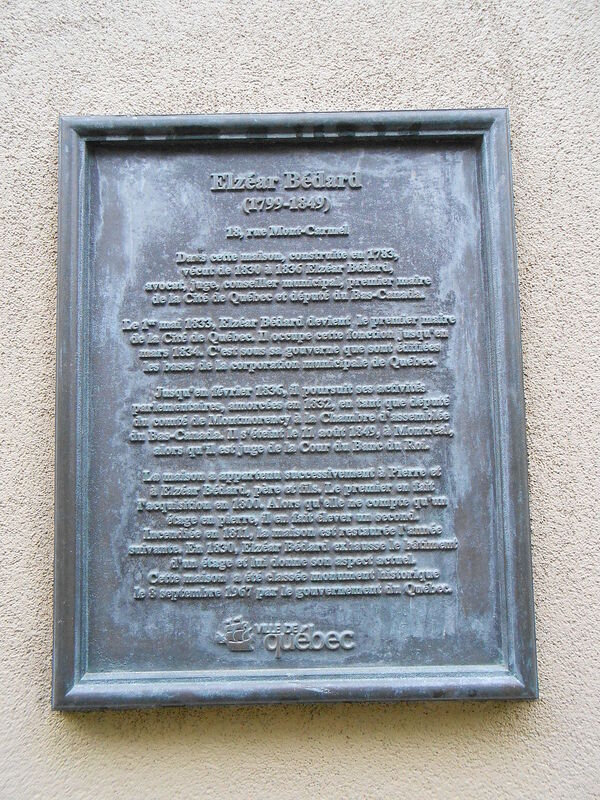 For instance, he was involved with the Quebec Fire Society, the Quebec Benevolent Society and the St. Andrew’s Society of Quebec. 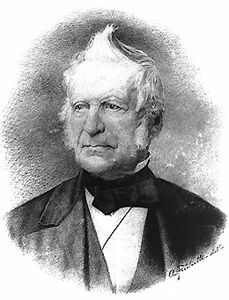 Between 1826 and 1832, he was the president of the Société d’agriculture de Quebec. Neilson even operated a sugar shack at Sainte-Anne-de-la-Pérade. Sonia Chassé, Rita Girard-Wallot, and Jean-Pierre Wallot, “Neilson, John,” Dictionary of Canadian Biography. Maxime Dagenais, “‘Le Conseil spécial est mort, Vive le Conseil Spécial!’ The Special Councils of Lower Canada, 1838-1841”, PhD diss., University of Ottawa (2011). Allan Greer, The Patriots and the People. The Rebellion of 1837 in Rural Lower Canada (1993). Gilles Laporte, Brève histoire des patriotes (2015). Ronald Rudin, The Forgotten Quebecers (1985).